Chris has always had a passion for animals and when Chris began his riding career when he was 12 years old, with coach Judy Cummings in Victoria, BC. This passion grew to another level. Chris believes strongly in letting horses be horses, when they are happy and relaxed you will get consistent and peak performance from them. 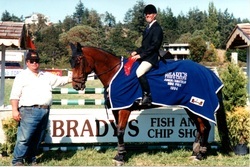 It was at a Courtenay horse show where he met his famous horse Condor, the two became an unstoppable pair at any show they entered. He later went on to ride with Peter Holmes, competing all over BC. They went on to compete at Spruce Meadows were they held their own in the Grand Prix rings, 1.40m-1.50m. While riding at these shows Chris was offered coaching from many other German riders in the grand prix rings, even Ian Miller helped him out a time or two during warm ups at Spruce Meadows. Chris trained with German dressage coach Alex Wortmann, a German F.N. certified dressage coach (Reitlehrer), whom helped get him a job at Parkland Meadows in Alberta, where he also began training with German instructor Hartmut Gutzmann. While at parkland Meadows, Chris would ride 15 plus horses a day and would be doing anything from breaking new horses to riding seasoned show horses. Chris has taken many clinics over the years some of his more memorable clinicians were Michel Vaillencourt (when chef d'equipe), Judy Gullelis and Daton Gorslan. Although his heart is in the jumper ring Chris has a very strong dressage back ground and believes that all great jumpers begin with a strong solid foundation of dressage. Trish has always had a love for horses, finally at age 12 Trish was given riding lessons as a Christmas present, and she has never looked back. She was given the opportunity as a young teenager to ride the different horses at the stable. Trish has always enjoyed starting and backing young mounts. She equally enjoys spending the time with horses that need a restart or require more training and are considered difficult. Trish uses natural horsemanship working with pressure and release when training the horses. After taking a few years off riding to focus on a career Trish got back into riding again and began riding competitively. Trish takes regular clinics when available to always be learning. Born in Campbell River, Trish has always had a love for the up island lifestyle and was lucky enough to move to the Comox Valley. It was at the Benefit Horse Show in Victoria that she met her soul mate Chris Cowland, now married the two bought their property together with a dream, now known as Sprout Meadows. Shannon has over 30years experience in the industry with a passion for excellence in horse care, stable management and teaching people how to ride. She started riding at age 6 both English and Western, she then started formal lessons under Lisa Mander (well known certified judge, and hunter/jumper coach) and competing in local shows all over the lower mainland and Fraser Valley with multiple awards won. Shannon spent 4 years training and competing in vaulting under Jutta Wiemers (well known German vaulting trainer). At the age of 12 she began training with Dr Susan Thompson (EC coach 2). Shannon has attended many clinics over the years with such notable clinicians as Eleanore Elstone (Paralympian and EC coach 3), Dietrich Von Hopffgarten (well know German dressage philosopher, trainer and author ). Shannon is a true horsewoman, over the years she has helped bring up multiple young and untrained horses. Her dedication to their care and ensuring her students also learn these skills is evident in her coaching. She has Completed EC rider program (1-8) under the direction of Dr. Susan Thompson, Completion of equine specific NCCP (national coaching certification program), and was involved in working student programs through Susan Thompson, shadowed vets through clover valley vet hospital, spent nights on “foal watch”, excellent stable management skills, visited stables in England have helped groom top level performance horses at European horse show. Laila has always been passionate about horses, after moving to the Comox Valley she started to learn natural horsemanship from there her her love for horses took off. At the age of 9 she started taking hunter / jumper lessons while being involved in the local pony club. Through pony club Laila was able to attend many clinics for different disciplines, this is where her love for dressage started. Intrigued by the discipline and she began taking formal dressage lessons. While working under and learning from her dressage coach this helped lead Laila to ride and study theory in Germany in 2016. Laila looks forward to growing her knowledge by returning to Germany to continue her studies yearly. Laila is excited to have the opportunity to share her knowledge with other people and is looking forward to teaching new riders who share the same love for horses she does. Megan has been riding for over 28 years competitively . She is pony club certified and has been training horses( ie. starting , breaking training up to show quality Hunter / jumper eventing / top FEI up and coming mounts ) , coaching on property and off at shows, help in sales barns for the last 12 years. Megan grew up on her parents horse farm where her mom also a coach, actively breeds and shows in AQHA. Starting her showing career at 5, Megan early on was the go to rider, helping coaches train ponies at the age of 8. She is actively a hunter jumper coach as well as trained in classical dressage. Megan has trained with some of Canada's and best and elite . Megan has been a pony club tester for her club. Eventing with pony club all the way up to prelim and did one 3 star with her coach which Megan says was a lovely experience; still loving cross country to this day. ​Monique is a very accomplished instructor and has recently moved from the mainland to Vancouver Island. She has bred and raised/trained multiple horses to Pre St George level, along with several other to Intermediate 1 and Intermediate 2. Showing with Rosewyn Rage’n’Sea (by Sea Fox, out of homebred Rosewyn Tai Chi –Lt. Governor’s Cup Winner) Monique has trained for years with top highly sought-after professionals such as; Dietrich von Hopffgarten for four years, Leslie Reid for five years, and Albrecht Heidemann for ten years. Monique has had multiple Championships with her students over her many years of coaching, in both Dressage Shows and Western Dressage Shows.